For LG G5 H820 H830 H831 H840 H850 with Frame Assembly. Each display screen was tested one by one with our board before shipping to make sure it works perfect on your device. 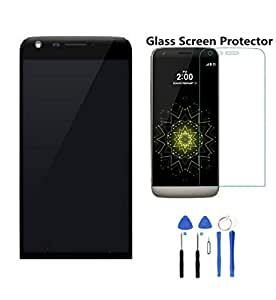 It comes with LCD Display Screen and Touch screen and Outer Glass, also Pre-installed Mid Frame, easy installation by using the provided tools. Replace any LCD with damaged or white screen, dead pixels or low quality pictures, and replace any damaged or malfunction touch screen that gives you improper responses. 2 Year Warranty, 30-Day Return Policy, Free Fix Tools Set, So you can feel comfortable with your purchase! * Each display screen was tested one by one with our board before shipping to make sure it works perfect on your device. * If you don’t know how to install it, we suggest you to find a professional technician to do for you. Installation guide is not included. Please be sure you know how to install it before buying.